Turn genetic data into useful information. Yes, I Want To Order Whole Genome Sequencing services. CMT and Sequencing.com have created an exclusive Preferred Provider Discount with Genomics Personalized Health (GPH) that offers a Whole Genome Sequencing service through a highly reputable CLIA-certified lab. Please complete the form and payment below to receive non-invasive saliva collection kits for Whole Genome Sequencing. Sequencing.com is the world's only HIPAA-compliant platform for apps that turn genetic data into valuable information. Approximately 8-10 weeks after sending in the saliva specimen of your patient the data and reports will be available for you to access at any time via your own confidential account at Sequencing.com. This includes lifetime HIPAA-compliant storage of the genetic data and reports. The account is highly confidential and the genetic data and reports are never shared with any third party. Whole Genome Sequencing data will be provided as both FASTQ and genome VCF files. In addition to the sequencing data, you’ll also receive two genetic reports focused on empowering you and your patients. The reports are designed to be easy-to-understand and actionable with a focus on enabling the personalized prevention of disease. ATLANTA, GA - Concierge Medicine Today issued a statement of support, noting, "Genetic technology has reached the point where the cost of conducting comprehensive genetic testing [ie. Whole Genome Sequencing] for hundreds of preventable diseases at a single time is now affordable," said Catherine Sykes, CEO and Publisher of the national trade publication. "After years of thoughtful consideration, careful research and review, countless hours of dialogue with various physicians and technology companies, we encourage Concierge Medicine Physicians to make personal genomic data information available to patients so that they can start to understand their makeup, learn more about their individual genome and predictors, and begin to use these insights to improve their lives." The accuracy of whole genome sequencing is quickly improving and the cost is quickly dropping. Within the next couple of years, this technology will most likely be widely used by Concierge Physicians in the daily clinical care of their patients. 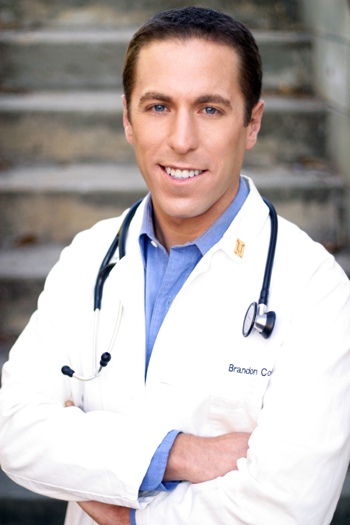 "The genetic revolution has already begun, and it is having far-reaching effects on healthcare right now," said Brandon Colby, MD and author of Outsmart Your Genes. "Our knowledge of how to use this information is increasing at an exponential rate. What this means is that we can now start to integrate genetics into our everyday lives. With comprehensive genetic testing, we launch an innovative strategy against disease, attacking it before it even manifests. Genetic testing, therefore, provides a new counter-offensive in our war against Alzheimer’s, cancer, heart disease, and many other diseases that have plagued our civilization for centuries. This is the most exciting, and potentially groundbreaking, medical development of this century." "The data, however, should be owned by the patient. Their Physician can help direct them on how to apply the information contained in WGS to maximize its benefits,” states Michael Tetreault, Editor of Concierge Medicine Today. "Patients need the ability to securely store, use, and understand genetic data." Colby notes, whole genome sequencing allows him to "cast a wide net" by generating a tremendous amount of genetic data. He then uses apps at Sequencing.com that analyze the data and provide straightforward reports focused on relevant, actionable findings. He also noted that there are five questions you [patients and physicians] need to ask in order to assess the quality of the outcomes data: (1) The credibility of the laboratory doing the testing; (2) What types of diseases are included in the test; (3) How thoroughly does the test actually evaluate risk for each of the diseases; (4) Whether the information is provided in a way that makes it actionable; and (5) Will the results be delivered in a format that is straightforward and easy to understand? At the Louisville Innovation Summit (October 2015), former White House CTO, Aneesh Chopra outlined his vision for a future of healthcare managed by "information fiduciaries." "We are essentially undergoing the most entrepreneurial period in healthcare history," Aneesh Chopra told the crowd at the Louisville Innovation Summit. In his keynote speech, From Innovation to Integration: Understanding the interdependence on people and data, Chopra presented his vision of the future of healthcare. That future, Chopra explained, is dependent on the careful management and integration of data into patient care. Chopra envisions a future where "each and every one of is given a valet key to their data." The valet key, Chopra said, is not unlike how Netflix determines your user preferences. These valet keys can be distributed to patients. "They can be handed to an entity that the patient trusts to organize and manage their healthcare. Within a couple of years, Concierge Medicine Today understands genome sequencing will most likely be widely used by [Concierge] physicians in the daily clinical care of their patients. Currently available in academic medical centers, this advanced healthcare decision support tool provides the ability to predict and prevent disease and, if disease manifests, personalized therapies tailored to each patient. Due to decreasing costs and better understanding about how this information can be made actionable, this technology is now accessible to Concierge physicians. “Anything that moves us toward the realization of better outcomes using data and evidence-based medicine gets a green light by Concierge Medicine Today” says Publisher, Catherine Sykes. “Whole Genome Sequencing used by Concierge Doctors empowers them to move purposefully in a predetermined direction on behalf of their patients. Our observation is that physicians and patients without clear vision are easily distracted. They have a tendency to drift from one ailment, prescription, problem or activity, to another. 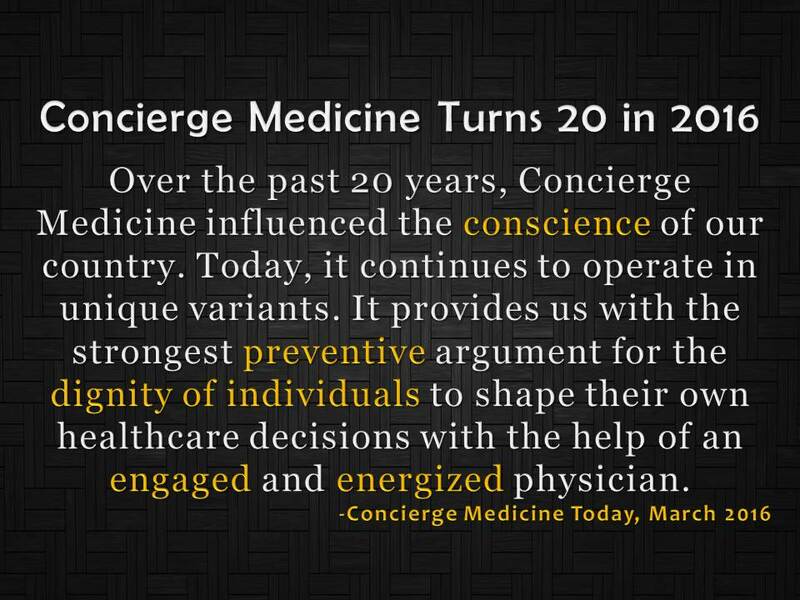 Without Concierge Physicians at the helm, there is no relational, financial, or data-driven compass that will appropriately impact a person’s life. Consequently, Physician surveys are finding that they are often making insurance-based decisions almost entirely on a patient’s insurance plan coverage (56%), decisions which can rob patients of their health, lifestyle and dreams." "What would happen if a physician were to begin speaking to a patient's future potential rather than their past performance?" adds Colby. "Where the practice of medicine may fall short, a story is often found in our DNA that will provide clarity. Instead of waiting for sickness to occur, the clarity provided by a patient’s DNA can empower a Concierge physician to create a personalized plan for optimizing each patient’s health and longevity." Sykes concluded by saying, "Concierge Medicine Today believes that having your whole genome sequenced provides access to information that can empower people to improve their long term health and wellness. We support the use of Whole Genome Sequencing within Concierge Medicine programs and believe knowing more about your DNA will allow you to take steps towards living a healthier life." As a healthcare professional, you can use your HIPAA-compliant Sequencing.com account to store and access your patient's genetic data and genetic reports. Some labs import genetic data files directly into Sequencing.com while others require you to request to have the data stored in your Sequencing.com account. If your patients already have their genetic data stored at Sequencing.com then just ask them to share their data with you. You'll then be able to perform clinical interpretation on the data using apps available in the App Market. The genetic reports produced by the apps can be shared via Sequencing.com with the patient, download as PDFs and added to the patient's EMR or printed and added to the patient's chart. Sharing genetic data and genetic reports is easy and secure.